Very nice quality and easy to put together. 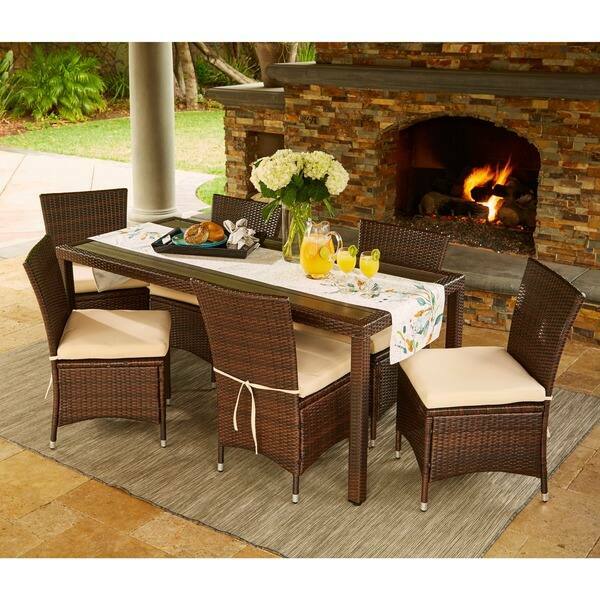 Host a refreshing outdoor dinner party with this contemporary dining set from Havenside Home. Featuring a durable resin wicker construction around an rust-resistant aluminum frame, this dining set allows you to take your dining experience to the next level. There are so many options out there that it started to get overwhelming. I chose this to replace a round table we've had for years which took up more space than I wanted. When I received this and it was assembled I was thrilled with how much extra deck area we have now, and the style of this allows for more seating than my six chair round did. The reason is that the table legs are positioned so that you can actually put three of the chairs along each side and could even use two other coordinating chairs for the ends. I was planning on putting felt guards on the bottom of each leg but I discovered that the chairs easily move without the slightest marking of the Tek deck. Having a hole in the rectangle table for an umbrella was important for the location on the edge of the deck under a pine, and this was one of the selling points for me since I noticed many rectangle tables don't have the umbrella hole. And a regular round umbrella looks fine with this. I have a long rectangle umbrella but opted for the round and it has plenty of coverage. Really happy with the easy care wipe up of dust and bird droppings. I feel like this material will last a long time. The cushions that came with it are quite nice, water repellent and stains wipe up with soapy cloth, and attach with ties around the back of the chair. Very happy with this purchase. Was waiting to order this for a long time. So glad I did. It sells out quickly so don’t wait. The set is nice quality. The chairs were pretty easy to essamble. The set is not very large, just the right size. Shipping was fantastic as I received the set about 3 days earlier than originally estimated. This is great outdoor furniture for the price. I was extremely pleased with my purchase. Table and chairs are very durable. The cushions could be a little thicker, but overall a great buy for the price. I love this set! I was worried about the durability of the wicker as some start to peel or break after a few sittings, but not this one. We’ve had it over a year with 2 children that play on it/around it and it’s still in excellent condition. The only negative thing is the color of the cushions and stains. I have to soak the covers for 6 hours in Oxiclean before washing and they still don’t come out 100% clean. But they have not ripped or have any holes so that’s a pro too. Love this!! Arrived Quickly and in good condition. Outstandingly beautiful. Would highly recommend this. Putting it together now and it looks nice. There was some unraveling of the wicker on one of the chairs so hopefully a replacement can be sent. Otherwise, it looks good! "Chairs are stackable or no"
No, these chairs are not stackable. "Can you purchase more chairs that are in this set?" These chairs are not available for individual purchase, however you may enjoy item# 19788779. "Does the table feel sturdy or does it feel flimsy? Lets say would it be stable in slight windy conditions? Is it heavy?" This table weighs about 55 pounds. It is made of hand crafted weave resin wicker and has a brown composite wood plank top. It is perfect size and material of construction for our screened porch! "What is the weight limit for the chairs for this set? " The weight limit of each chair is 300 pounds of evenly distributed weight. This set does not include the umbrella. The 7 piece set includes a dining table and 6 armless chairs.